I had the Majyk Equipe Dressage boots (both front and hind, as my mom bought me the hind set for Christmas) all boxed up and ready to take to UPS for return when I got a blog comment from Majyk Equipe earlier this week. Talk about great customer service! In the rep's lengthy and very kind comment, she pointed out that I had put the boots on backwards in my original post, and asked that I try them again the right way. I had realized that earlier when a reader pointed that out and tried it already, and while it didn't help with fit, I decided to give the whole set a second look anyway. I love those boots and want them to work, and am so grateful to her for reaching out to me. The rep said that they are marked with Left and Right on the inside of the boot. I spent quite a while looking for the marks yesterday and never found them, but I did manage to get them on the right way this time. 1. 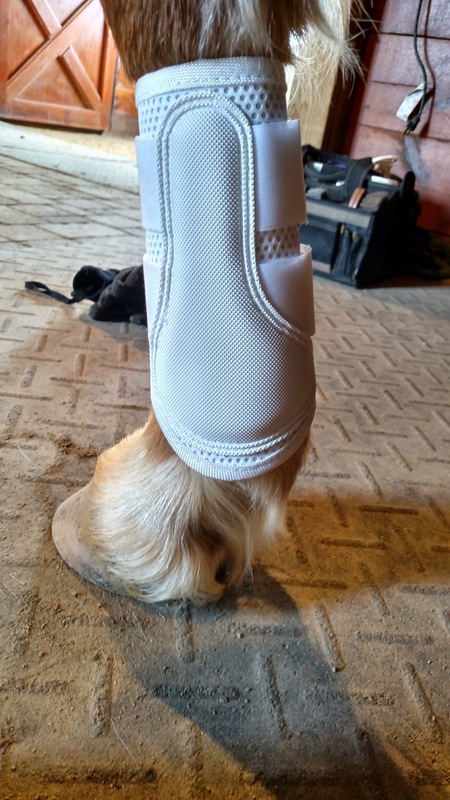 Dressage boots are for schooling only, so aesthetics aren't terribly important. 2. The important surfaces to protect from impact are the inside of the legs. 3. He's got a full winter coat and feathers under there, so they may well fit a lot better with his summer coat. Plus I'm planning on clipping his feathers this show season...can't believe I said that out loud. 4. 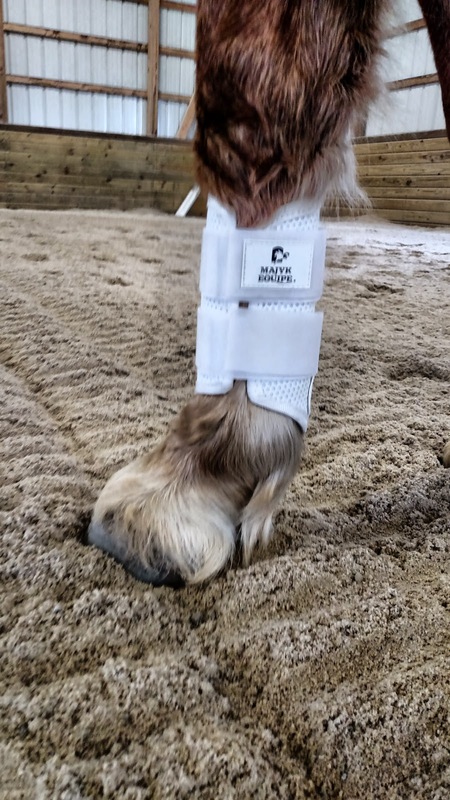 I really am a huge Majyk Equipe fan, their product design is top-notch and hits the sweet spot of heat dissipation/maximum protection/low water retention, and I want these boots to work enough that I'm okay with a fit that would otherwise make me send them back. Fronts again, with the gap. The medium hinds that my mom got us for Christmas have always fit well, but I had planned on sending them back if the fronts didn't fit. Contrary to what you may think from my mismatched tack and XC boots, I don't like being mismatched if I can help it! The two sides of the boots just barely touch. The front strap here needs tightened. I did try the mediums on the front legs, which was another of the rep's suggestions, and they were way too long. 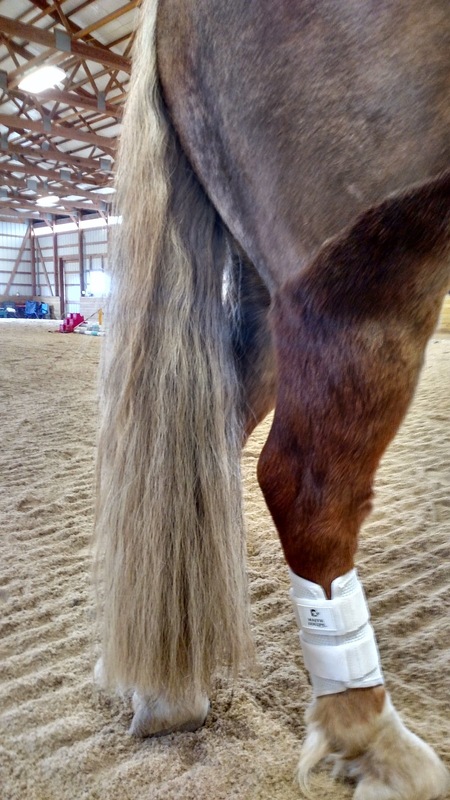 They hung an inch or two off of his fetlock. I expected that, based on how well they fit his hinds. After the initial comment, the rep and I exchanged emails back and forth. She talked about how they try to ensure the boots fit as wide of a variety of horses as they can, but there are so many variations in length and diameter of cannon bones that it's difficult to fit all of them. 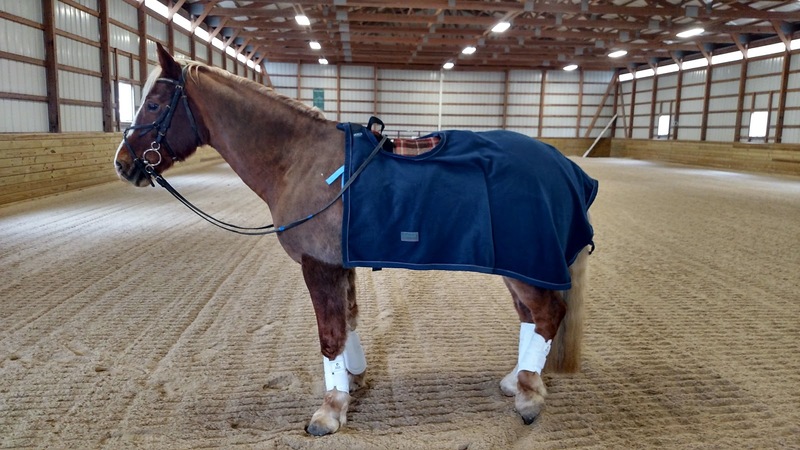 I understand that, and I know that some horses, like Connor and JenJ's Paddy, are unusually shaped outliers that may just not be suited for wearing boots. All in all, it was a great and unexpected customer service experience from a company that I already respect greatly just based on the quality of their product. I would have sent the boots back had she not commented on this blog. 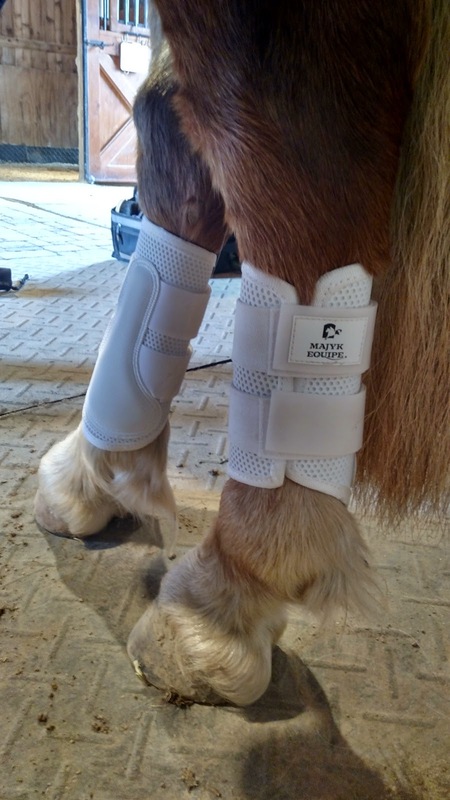 Plus, in my first test ride with Connor wearing them, I could hear him scraping the boots constantly as I tried out some new lateral work exercises from When Two Spines Align: Dressage Dynamics. I felt a lot better knowing that he was scraping against the best boots on the market instead of his own legs. Thanks, Majyk Equipe! 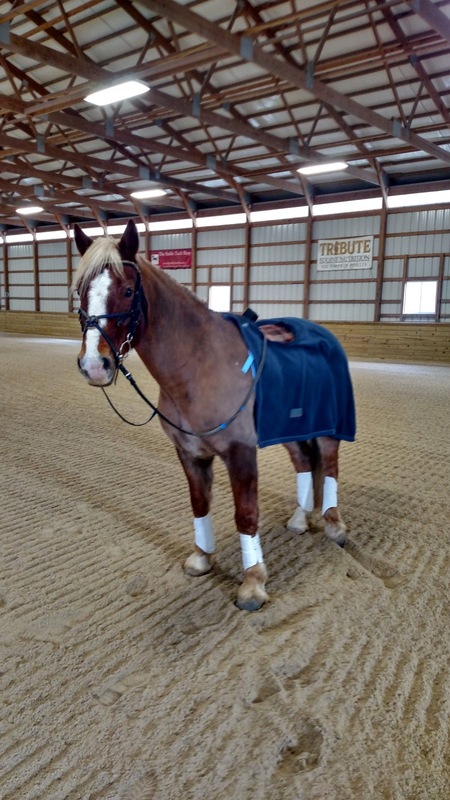 Looking good in a full set of 4 matching boots for the first time ever! Even his shipping boots don't match. 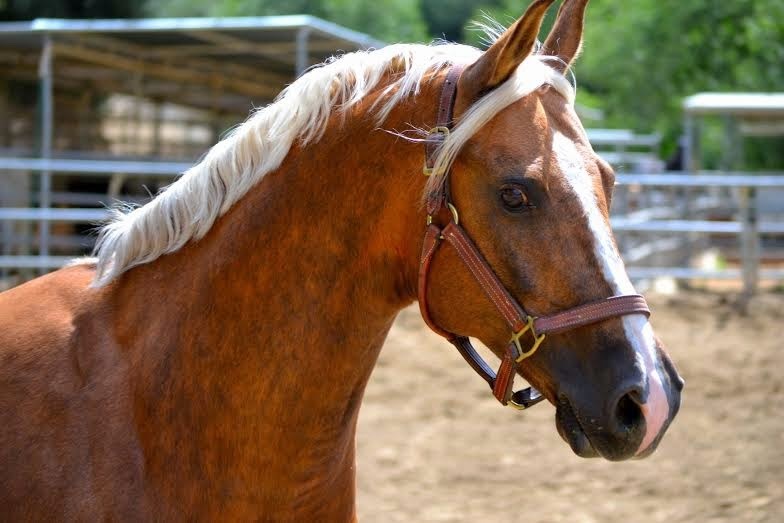 PS - The rep also sent along a photo of one of Majyk Equipe's test subjects, Shiloh, because he looks a lot like Connor! He's gorgeous! So wait. Is the fit issue the gap in front? I'm confused. They look fine in the photos. What am I missing? It's the side gap. Those pictures show them cranked as tightly as I could muscle them, after they had had an hour to get warm on his body. Normally they have a much bigger gap, but oh well. Yes! I am looking forward to making him look even more like a tiny warmblood. Yay for great service! The fit actually doesn't bother me at all from the pictures, that gap seems like no big deal. I'm still in love with mine and look forward to purchasing some hinds, love white boots! Me too! I am working very hard to keep them white, too! Good to hear about great service from a company whose products I really love! Glad to hear a good review. :-) I just picked up the ME open fronts for C-rage and I think I kind of love them. That is exceptional customer service!! Well done. 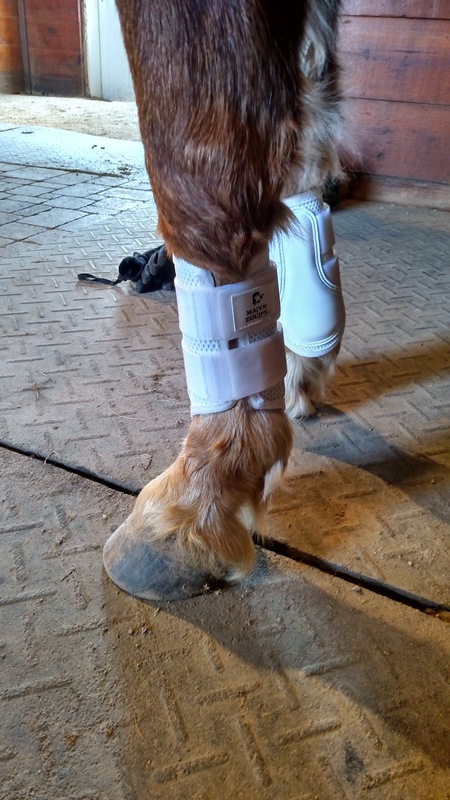 Having short horses with bigger legs is rough. I love nothing more than to boot up my horse to the max! Im going to bit the bullet and order some Woof boots in medium but extra wide but they don't have them in USA so I have to pay over double normal price to get them :/ Glad you found some to work for your boy! They look super cute even though he's SO FLUFFFYYYY! Connor's adorable. how awesome it all worked out for you! I've eyed some of their boots before, glad to hear they had such great customer service.